Premier Deep Sea Fishing Attraction! "Everyone fishes on the Reward Fleet!" Come with friends, family, or by yourself! Call or E Mail For Pricing! 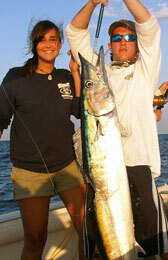 Sportfishing in Miami, Miami Beach and South Beach for over 50 years! The Reward Fishing Fleet has been providing visiting as well as local anglers with premier deep sea fishing experiences for over 50 years. All of our captains grew up fishing in Miami and have over 100 years of local knowledge. We pride ourselves in our ability to catch fish from a party boat that will keep all types of anglers happy. Our accomplishments speak for themselves. Small panfish for a fish fry, or big game fish that most sport fishing boats only dream about. We have landed blue marlin to 450 lbs., white marlin to 105, yellowfin Tuna to 100, hundreds of sailfish (140 last year), dolphin, kingfish, amberjack, snapper, and grouper. Planning a corporate or family event? 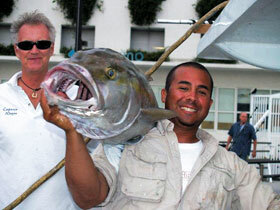 How about a bachelor party fishing trip in Miami, Miami Beach, or South Beach? We can do it all! contact us for a quote!